I was most delighted over the Easter weekend to receive an Eggstra special Easter delivery from John Lewis. This egg themed basket did not contain a single ounce of chocolate, just everything needed to cook the perfect eggs. So my Easter Eggs this Easter Sunday will not just be of the chocolate kind but either poached, boiled, fried or scrambled. I have already put the John Lewis 'The Pan" through it's paces. I have never cooked poached eggs this way, but it was very straight forward and a few minutes later out popped my poached egg. I think a minute less and the yolk would of been lovely and runny. This way of poaching eggs is much easier than swirling an egg in a pan of hot water, particularly for me and my aversion to vinegar. 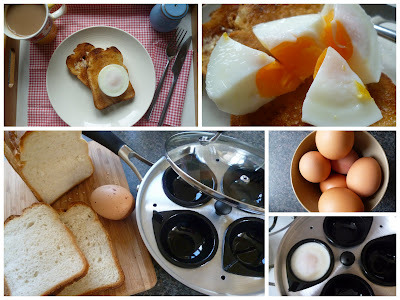 Of course this pan can be used other than just poaching eggs, the poaching pan lifts of the top leaving you with a deep lidded frying pan that is not to weighty. I have used the Poachies bags before and they are very handy for taking on holiday. I'm looking forward to trying the Silicone Egg Poacher, they seem practical and straight forward. I was delighted to see the Perfect Egg Timer in the hamper. Whenever I make boiled eggs I have a habit of thinking I have set the timer on the oven to remind me when it's four and a half minutes is up - no need for the timer now! As for the One Egg Wonder Frying Pan well that will be put to very good use for those days when only a fried egg sandwich will do. I would like to thank John Lewis for sending me this Eggstra special Easter basket. Getting parcels in the post is pure delight (well if you discount all the associated packaging). What a lovely Easter hamper.